The Index of Cyber Security is a measure of perceived risk. A higher index value indicates a perception of increasing risk, while a lower index value indicates the opposite. What is the Index of Cyber Security? The Index of Cyber Security is a sentiment-based measure of the risk to the corporate, industrial, and governmental information infrastructure from a spectrum of cybersecurity threats. It is sentiment-based in recognition of the rapid change in cybersecurity threats and postures, the state of cybersecurity metrics as a practical art, and the degree of uncertainty in any risk-centered field. In short, the Index of Cyber Security aggregates the views of information security industry professionals as expressed through a monthly survey. Its form is an index for reasons that will become apparent. The Index of Cyber Security is for the cybersecurity professional (and others) who need an ongoing, methodologically transparent measure of the state of cybersecurity. Why do we think this will be useful? Going forward, the Index of Cyber Security will deliver consistent time series data useful to researchers, industry professionals, the media, security product vendors, and financial markets. How often will the index be updated? 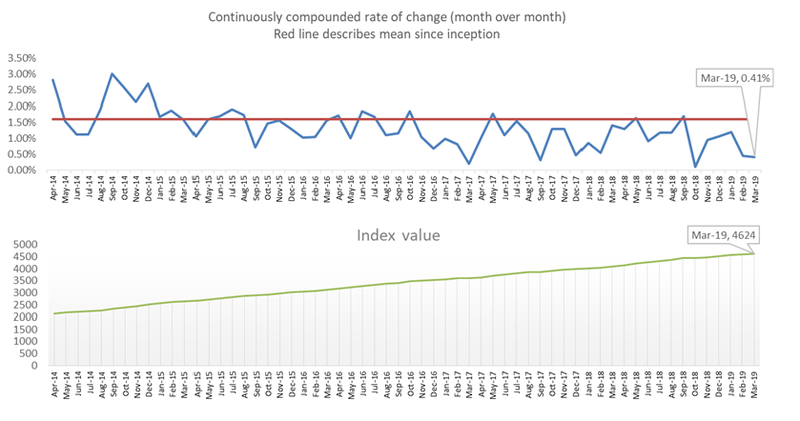 The index has been published monthly since April, 2011. The aggregate index value is updated on this public website on the last calendar day of each month. Detailed statistics and individual sub-indices are shared only with respondents in a separate report.